This is a list of various terms and japanese words we used throughout our articles, as well as a collection of related general information. A class of warriors that existed in old Japan. Consisted of about 2 million or 3% of total population. 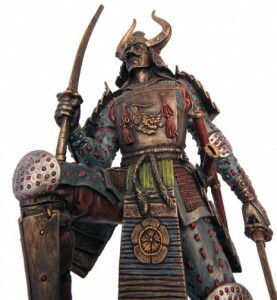 Read more about samurai or samurai history. Wearing method of swords. The sword is hung from a belt with the cutting edge facing down. Wearing method of swords. The sword is hung from a belt with the cutting edge facing up. Means “Sword of the ancestor”. Learn about the origins and history of katana. A form of ritual suicide. Literally means stomach-cutting. Closely related to bushido, the samurai code of honor. A group of men or women who were specially trained for espionage and assassination. They were usually from lower classed, and used by the daimyo to assassinate enemies and penetrate enemy fortresses. During the Tokugawa period, that title was given to samurai who did not serve a any master, either because the master had died or because his lands had been confiscated. A number of these ronin became martial arts teachers or began some other job which was compatible with their samurai status (e.g. bodyguards).